Gary: You know, these guys played against Peter Marshall's son. Keith: What was his name? Keith: Yes it was. (Laughs all around.) I'm so sorry folks. It was the only moment of laughter in a night that proved once and for all that 2007 is not 2006. They actually made me hungry last night-- what with the tribute to "Mama's." I suddenly had a fresh mozzarella jones like you wouldn't believe. Also there was the gleeful (on one side), slightly defensive (on the other) inventory of Ron's snack in the stands (probably what accounted for his silence most of the time he was there). Let's see, hot dog, cole slaw, fries and a Diet Pepsi. "That's all right, isn't it?" "Aren't you on Weight Watchers?" demanded Keith. "Um, well, yes I am," allowed Ron. "It's like one of Rusty's orders," Keith continued. "Thirty cheeseburgers and a Diet Coke." Of course, I lost that mozzarella jones when I saw Endy pull up with his hammy on the way to first. Damn. Ron Darling has signed a multiyear contract extension with SNY, according to their website. Yay! Coincidentally, I was reading Roger Angell's Game Time last week, in which he visits Ron at the beginning, and near the end of his pitching career. In Oakland, Ron observed rather wistfully that the younger players rarely just hung around and talked baseball anymore, and that he missed being able to do that with Tom Seaver and Keith Hernandez. Life sure is funny. 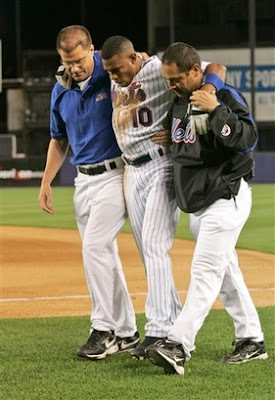 Finally, what's with this rumor of the Mets getting Zambrano? Jeebus. Why? Why? Why? Why inflict this bozo on Willie, LoDuca, Castro and Rick Petersen-- and us? Pleeeeze don't do it.